WordPress offers lots of building tools and Widgets are one of them. They are simple drag and drop tool using which you can add tons of additional containers holding information on your blog. The sidebar of your WordPress site is one of the key points of your site. It is not difficult to imagine, after all, when a person will view a page of your site, there is very likely that the latter is at least composed of a sidebar. In this article we have compiled a list of top 12 awesome WordPress free custom sidebar widgets for WordPress blogs. You are most welcome to suggest any additions to this list. You can use the comments box below to make any suggestions. You might also want to take a look at our previous selections: Free WordPress Themes With Parallax Scrolling, Amazing Free Multilingual WordPress Plugins, Free Banner Ads Widgets for WordPress and WordPress Premium Themes for Musicians. This plugin adds a button to widgets area to create a new sidebar area which you can later use just about anywhere. To display the sidebar with shortcode you can use [stag_sidebar id=”custom-sidebar”] where id is the id of the sidebar that appears in the description area of the respective widget area. You can also pass an additional parameter class in shortcode to add class to the widget area wrapper on frontend. Manage an infinite number of sidebars. Boost on-site SEO with better Calls to Action by controlling what content or context your sidebars should be displayed with. The sidebar manager makes it incredibly easy for anyone to create dynamic, custom sidebars without the need of code. Developed with functionality and performance in mind, Content Aware Sidebars is the only plugin of its kind that will never hog or slow down your site. Widgetized pages in WordPress are very powerful tool. Have you ever wanted to drag and drop a widget in a page content area, but the only widgetized sections of your theme are usually sidebars and footers? You can now easily widgetize a page and drop widgets in page or post content area or any template file. Custom Sidebars allows you to create all the widgetized areas you need, your own custom sidebars, configure them adding widgets, and replace the default sidebars on the posts or pages you want in just few clicks. Set widget visibility based on rules ranging from user roles to post types, individual pages or taxonomies. Clone sidebars to save hours of work and then link them to update synchronously or allow them to be individually edited. A simple and easy way to replace any sidebar or widget area in any WordPress theme without coding. This plugin integrates with the WordPress Customizer so you can preview your custom widget areas on your site in realtime. It’s compatible with any theme and you can even replace more than one widget area on the same page! You are able to replace multiple sidebars/widget areas on the same page. 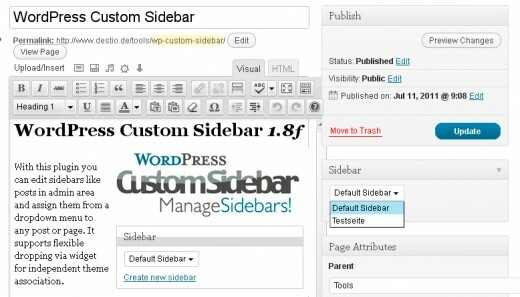 It allows you to manage your custom sidebar replacements in the WordPress Admin area. Create custom sidebars (widget areas) and replace any existing sidebar so you can display relevant content on different pages. The content of the new sidebar will be displayed on the exact same spot as the one you select to replace only for those pages you selected. IntelliWidget is a versatile WordPress plugin that does the work of multiple plugins by allowing you to create custom “Profiles” for any page or post that can be used where the default widget would normally appear. Each profile can have its own set of rules to display content any way you wish. With this plugin you can edit sidebar contents like posts in the admin area and assign them from a dropdown menu to any post or page. It supports flexible dropping via widget for independent theme association. Easily create all different kinds of popups / overlays for your WordPress site and place sidebars and widgets in them. This plugin will allow you to create unlimited number of custom sidebars that you will be able to place in your overlays. Once a sidebar is created it will be available in Appearance -> Widgets section just like any other sidebar. A WordPress Plugin to create a custom widget areas or sidebar easily. It allows user to create multiple widget areas from admin panel. Power Widgets creates custom widget areas (AKA custom sidebars) for specific pages, posts or categories, and manages them from one single location. Allows you to create and manage custom sidebars and assign them to specific pages, posts, tags, categories and page templates. Transform any page/post of your website or blog using the powerful template builder or reuse templates without changing themes. Impact Template Editor gives you everything you need to create attractive sales, affiliate, landing, squeeze, marketing or any page you can imagine of quickly and easily.